Up until now, we have largely approached the question of Ritualism from the outside looking in. I gave the briefest of examinations of the different approaches to ritual behavior, from expressing and negotiating power dynamics, to establishing, renewing, and enforcing communal order, and providing a sense of cultural identity and meaning. Lastly, we looked at the ways that Communication is both a purpose of ritual, in that it exists to communicate with the numinous, and the vector for the other purposes. Up until now, I have spoken of ritual in very broad terms, and focused on the effects, or purposes of ritual. Today, I want to take a few moments to look at ritual from within a heathen perspective and approach it as a Heathen might. In the same way, rituals also establish, renew, reinforce, and perpetuate the community. We have Baby Naming ceremonies, we have funerals, marriages, rites of passage; we have birthdays and anniversaries, rituals for sending our folk off to war, and for perilous journeys, and for when they return; we have symbel. There are a lot of reasons to engage in ritual which do not have to do with the Numinous, but rather with ourselves. In this context, the actions we take seek to harness communication, power, order, and meaning, and apply them inwards towards the community. The interesting thing is that these two impulses, the one centered on the generation and perpetuation of the Cosmos, and the one centered on the generation and perpetuation of the community, live on the same axis. As one impulse is emphasized, the other, by necessity, is de-emphasized. Ritual drama is a good example of this. As the dramatists wear masks, they are transformed into the other, they exist outside, for a time, of the community, and the Masks mark them so. The very act of emphasizing the mythic or cosmogenic power of them, as Gods and Heroes, de-emphasizes their connection with the people. Your Uncle may play Þúnor in ritual drama, donning a mask that marks him so, and you may recognize the voice, but all your interactions with him will be by ritual necessity not between family members or tribe members, but rather as human being and God. Conversely, the common act of setting out a plate to be given to the Gods, the Ancestors, and Wights is inherently commugenic. The inherent action communicates a very different style of interaction, where the point is not to continue the cosmos, but rather to continue to the community. The second aspect of ritual centers on the idea of gifting. I am in no way engaging in hyperbole when I say that the exchange of gifts, and all that entails, is at the very center of our religion. Gifts bind people together. They are the physical anchor of those relationships. The creation of man in myth is a series of gifts to Askr and Embla by the three primordial brothers. Before that, man was driftwood. Our rituals seek to establish, reinforce, and renew a relationship between Gods and men like that between guests and hosts, so that we may grow in friendship and exchange gifts. Gifting, and the exchange of gifts, works between men. Gifting is the process by which men come together, it is the process by which the community is reinforced. All ritual will contain some sort of gifting element. A Naming rite, for example, encodes the element of the gift in its very purpose, wherein the Parents gift their child with a name, giving it an identity and imbuing it with its Orlæg. Birthdays emphasize the giving of gifts, as does tradition at Geóltíd. In Symbel, it is customary to exchange gifts as well. In votive offering, blót and faining, the central act is the gift exchange, where a libation is poured, where the votive offering is destroyed, where the animal is killed. In certain rituals, we may focus on the request, the bót, being made, particularly when we are engaged in an act of propitiation. In our funeral rituals, we emphasize the giving, in that we place grave goods and food and things that the deceased will need in the afterlife. I propose that we can place almost any ritual action that a heathen may engage in on a field made up of the Cosmogenic-Commugenic and Giving-Receiving axes. By incorporating certain words, actions and materials into our rituals, we naturally emphasize and deemphasize aspects of these two axes to create the different classifications of ritual. The two axes form a Cartesian plane. Each quadrant of this plane contains one or more rituals that we are familiar. In the upper left, Cosmogenic, Reception, we see rituals of Thanksgiving and lustration, the rituals designed to ensure fertility and good harvest. The Anglo-Saxon ritual Æcrebót is, I believe, an example of this type of ritual. In the upper right, we see rituals of Giving-Cosmos. These are libations and other offerings, where the focus of the ritual is our offering and hopes for a later return. 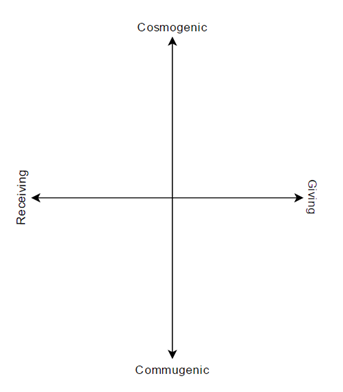 Lower left, the commugenic-reception quadrant is typified by Symbel and other hearth and community centered rituals, such as birthdays, or the Geóltíd feast. Lower right, the commugenic-gifting is typified largely by funerals and other chthonic and death related worship, but also in Naming and other rites of passage where we celebrate the different stages of our lives. It is important to note here that while we may classify different types of ritual by the elements they emphasize most, all 4 elements exist in any ritual, much as our “purposes” that we had been investigating exist. There will be cosmogenic elements in every ritual, even if only by their absence. Each element’s presence will help emphasize specific effects. It really depends on what the ritualist is seeking to accomplish, which elements become the focus of the ritual. While we have basically, only 4 directions of emphasis in ritual, everything is interpreted in those four vectors. When do you choose to hold your ritual? Who do you choose to hold your ritual with? Where do you choose to hold your ritual? How do you establish and separate your space? Which implements do you use? How do you process into your space? What words do you say? In what language? All these questions should be at the forefront of the ritualist’s mind when they sit down to plan how and what their ritual is. Incidentally, it is this, I believe, another reason why ritual manuals first formed and became relied upon. Ritual Manuals were recipe books, things that had proven to work for specific effects. The problem with ritual manuals today is that we don’t have recipes that have proven to work. We don’t have the twin refineries of time and tradition to whittle away at bad practices and create good ones. We have to start looking deeper, harder, trying to find the underlying principles to ritual action and basing our practices on those principles. We don’t have the luxury of doing things as they have always been done because if we do that, we’d be going to Church on Sundays.